It would only cost me $148.00 for the entire trip that would take a month to cross the USA and back by bus. The trip would go up through Canada to Quebec and then down the East Coast to New York and then home by way of the pioneer trail. I went right home and asked my parents if I could go. My mother was not in favor of the trip, but my father talked her into letting me go if I would earn half of the money. He said that he would pay the other half. I went to work mowing lawns and babysitting, and it seemed that before I knew it I had earned the money to go. This was the beginning of my love of travel. At such a low price it was a camping trip. We slept out every night except when we were in the big cities. Every few days we would stop for a swim, which was our bi-weekly bath. I traveled with 40 other 16- and 17-year-olds. We visited the Empire State Building, Times Square, Rockefeller Center and much more, but the thing that I remember most was the old-fashioned Automats. There were people behind the glass doors putting in food as fast as people would take it out. 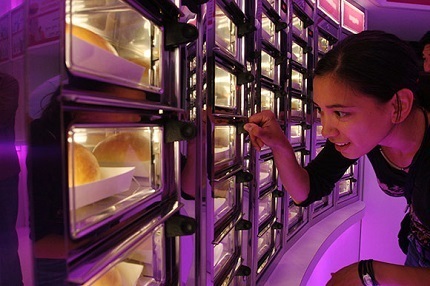 People would walk up and down the beautiful glass cases trying to decide what they wanted to eat. When the selection was made all you had to do is step up to the door, put your coins into the slot, and take out your food. Next you would hope that it tasted as good as it looked. This was the beginning of fast food in America. I wanted to go there for every meal, as the selection was the best and I thought that it was so much fun to go along the wall looking at all the food you could have. Oh, what a great trip this was! My next trip to New York was to be on the show “To Tell the Truth” to promote my newly released book called Roughing it Easy. They described me as one who could cook my hamburgers on a tin can stove, fueled by the daily New York Times. The panel guessed me right off the bat. I seem to have the look of a girl out of the woods and not a New York City slicker like the other two girls that were paired up with me. It did not take long for me to fall in love with New York again. For more than eight years, while I was on the NBC “Today Show,” I traveled back and forth about twice a month. I decided it would be fun to share some of my favorite places I learned to love on my many trips. Next week I will take you to enjoy some of the best delis in the world.